Was this a plumber doing electric work? Who do I call to get this fixed? OMG is that the toilet breather pipe ?? 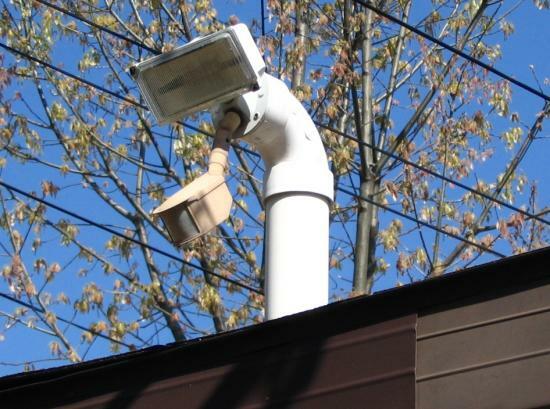 Or is that pipe and elbow just a means of mounting the security light fixture ? ? Thanks for the Pic, Jim!. I'd just like to ask how the gases that are supposed to get out of that vent pipe, escape?. Where you are located will decide if the DWV piping is ABS or PVC. I'm curious if the other end of the wiring comes up out of their toilet, lavatory, or shower. Maybe this is just a new twist on the old M80-down-the-porta-potty-vent trick? Visitor comes while homeowner is "taking care of business". Motion detector "sees" visitor, and makes. Resulting spark ignites methane gas in drainage system. Visitor waits 10 min after ringing doorbell while occupant takes a very necessary shower.